External tour of buildings including 18C Georgian houses, 19C Jewish Hospital, Prince of Wales Hospital and Holy Trinity Church, ancient High Cross Monument, Edwardian Town Hall complex, housing developments and Bernie Grant Arts Centre. 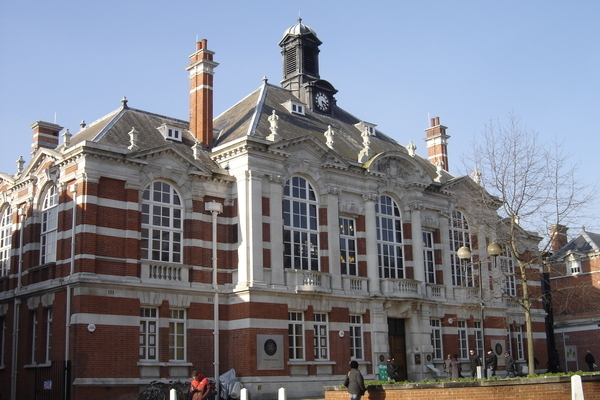 **Former Tottenham Town Hall, 1905 (Tottenham UDC foundation stone 1904). Town Hall until 1965. Used as municipal offices until 2007. Restored few years ago with housing development behind. ** Former Tottenham Fire Station (Tottenham UDC foundation stone 1904). Now Enterprise Centre. *Former Tottenham Technical College. Founded 1892. This building 1936-9 “in the austere classical style used in the interwar years by the Middlesex County Council to dignify further education.” Extensions 1955 and 1972. Now College of Haringey, Enfield and North East London. *Former Jewish Hospital, 1897-1901 and wing 1913. “Amply proportioned Free Jacobean composition in red brick, with shaped and stepped gables on a half H plan.” Now Sycamore Gardens flats. Talbot Road ** No. 41 Spring Cottage (date plaque 1857); *39, *33 and *31, *2-40 even. *Former Prince of Wales Hospital, 1881. Neo-Georgian. Founded 1868 as Deaconesses’ Institute training voluntary Christian workers as nurses. Became Tottenham Hospital in 1899 then Prince of Wales Hospital in 1907. Converted to Deaconess Court flats 1993. Note foundation stones to left of porch. **Mountford House, early nineteenth century. Pair of houses now flats. 316 High Road – built in 1920s as a post office. Also memorial plaque to John Williams. Side of 328 High Road – Banksy cartoon. *Rawlinson Terrace, 352-366 High Road and Synagogue. *Former Tottenham Grammar School, 1908-10 for Middlesex County Council. “Very large and grand with big dentilled gables and a Baroque entrance at the side.” This building replaced one of 1840 for the school founded before 1600. The school moved in 1938 to new buildings in White Hart Lane, since demolished. Converted to workshops in 1984. *The Green School, (founded 1792, Victorian building?). Now The Green Church of England Primary School. Tottenham Police Station, 398 High Road, 1913, Neo-Georgian. Memorial to police officer killed in 1909 Tottenham Outrage. Site of former Canadian Royal Skating Rink 1909 (later bingo hall and dance hall). Now turquoise modern building. **Former Tottenham High School for Girls, 1860-62. Originally built as The Drapers’ College, then became Tottenham High School for Girls 1885-1985, then High Cross School. “A large earnestly Gothic institution in stock brick and stone.” Converted to housing 1998 “Old School Court”. ** Gate piers and railings to forecourt of Tottenham High School for Girls. *Former Felvus Hall, 1926 addition to School. Now Christ Apostolic Church. **Former British Legion Club, 399-401 High Road, “behind a dismally neglected forecourt, a pair of C18 three-bay, three-storey houses, much rebuilt after a fire.” Now Tottenham Chances. *Former Tottenham Library, 391 High Road, 1896. Converted to “Library Court” flats 1994. *Former Swan public house, 363 High Road. First record of pub on this site 1455. Isaac Walton used to visit. Rebuilt many times. Now pizza takeaway. **Old Well and Well House. Well sunk 1791 by Lord of Manor after previous well enclosed. Present well-head dates from 1876. **Forecourt wall to Holy Trinity Church with side walls to back of grounds fronting Philip Lane. Details of all Haringey conservation areas and listed buildings can be found on council website. Although all reasonable care is taken, people taking part in TCS events do so at their own risk.